Maigret accepted, off duty, to help the Peeters family to elude from the awkward situation they are in. The facts of the case as he learns them from Anna, the girl who requested his help, are the following: The Peeters family, originating from Flanders, live in the French town of Givet. They are small grocers who run a store on the border with Belgium. Bargemen come there to drink. The family is not well-liked. All the town of Givet accuses "Les Flamands", to be responsible for the disappearance of Germaine Piedboeuf, daughter of a night-watchman. This girl had a child from Joseph Peeters, Anna's brother. 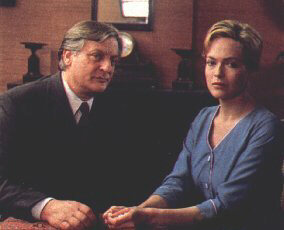 Joseph is supposed to marry Marguerite, daughter of the local physician, Dr. Van de Weert. So Germaine and her child could have been an obstacle for this marriage. Maigret's first investigations lead to nowhere. In fact, everything seems to clear the Peeters family from any blame. They are proud, honest and courageous people. à deux sous The only thing that worries Maigret is the turbid character of Joseph, the idealized son. Meanwhile, the body of Germaine Piedboeuf is dredged up from the Meuse river. The skull is smashed with a hammer. A bargeman, a man with a shady reputation and questionable habits, claims to have seen the Peeters one night, throwing a weighty object in the Meuse. But during a visit in his boat, Maigret discovers the hammer that was used for the crime and the coat of the victim. Although the case seems to be resolved, Maigret does not stop his investigation. More and more he gets intrigued by the behavior of Anna, who always keeps the same impassible and self-controlled attitude. The impetuous escape of the bargeman, clearly intended to derive attention, makes it obvious to Maigret that Anna is the murderer. Her almost incestuous admiration for her brother made her decide to dispose of the girl, so that her brother would not carry out his plan to commit suicide when ever he had to marry Germaine. 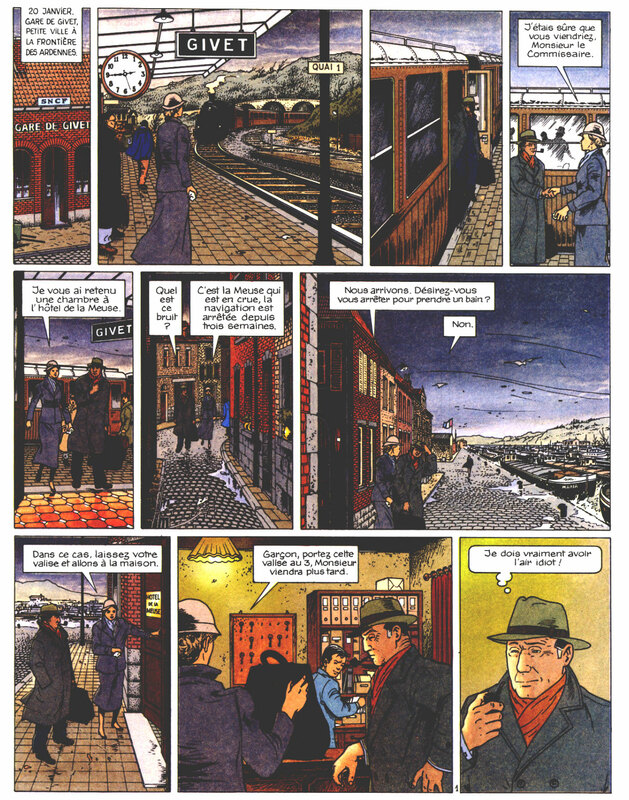 Cover and first page of the 1997 Claude Lefranc edition of a comic on Maigret chez les Flamands. Surprisingly, Maigret decides not to arrest Anna. Suspicions will continue to weigh on the escaped bargeman who disappeared without a trace and is not likely to be tracked down. Givet is a small town (8.000 inh.) in the Ardennes department (08) at about 300 km (186 mi) north-east of Paris. 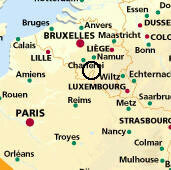 It is situated right on the border with Belgium. The Ardennes are not only a French administrative region but also a beautiful wooded and hilly area covering a part of the south of Belgium and the north of France. 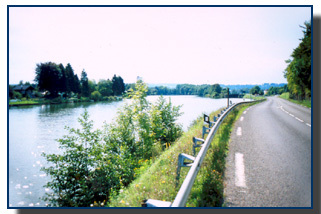 The Meuse river divides the town in two parts. The story is set on the left bank of the river where also the city-center is to be found. There is a bridge connecting the town-center with the right bank of the Meuse. "It was rather peculiar to look, from the city, or better from the bridge that constituted the central point of Givet, in the direction of the Flemish house. One found oneself in a French city. Small streets. Bars filled with devotees of billiards or dominos. The odor of anise aperitifs and familiarity all around. Then this stretch of river. The customs building. And finally, all at the end of the scenery, the house of the Flemish family." According to this description in the novel the house and shop of the Peeters family was to be found at 500 meters from the town-center. While walking with Maigret from the train station to her home, Anna, the oldest daughter of the Flemish family, explains to the commissioner which buildings they go by. "A endless, very broad, quay, with every twenty meters the mooring-posts for the barges. Some warehouses. A low building with a flag rising above it. - The French customs... Our house is further on, near to the Belgian customs... "
So, the Flemish shop must be situated in between the French customs building and the Belgian customs post a 100 meters away from the house. In the novel it looks as if the town-center and the Flemish shop are not more than 500 meters apart. The Belgian border actually is at 3,7 km (2.3 mi) from the bridge in the town-center. Probably Simenon reduced the real distance to make it possible for Maigret to cover the way in between the bridge and the shop by foot. On the actual spot there is a house that fits with the story. At present it is a private home but in past times it has been a café, the "Café Français". Simenon stayed in Givet in 1930, the novel was written in 1932. In this story he consistently changed all names of localities. The Café Français became the Flemish shop. The Café Français is depicted on an old postcard. The prospect of the house didn't change very much, only a window on the 1st floor (2nd floor - US) was widened. - Photo from the TF1 TV-series "Maigret chez les Flamands" by Serge Leroy - Bruno Cremer and Alexandra Vandernoot. - - Map by:Route 66, Route Europa 2000, Copyright Route 66 Geographic Information Systems B.V., Ede (NL). Adaptation by G. De Croock. (1) Translation and compilation from: Maurice Piron, L'Univers de Simenon, Presses de la Cité, Paris, 1983, p.283. Translation of excerpt: G. de Croock. 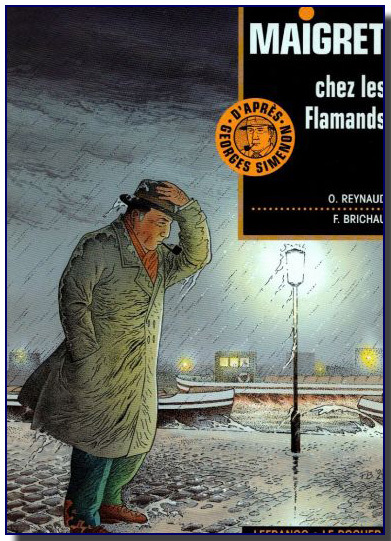 (2) Georges Simenon, Chez les Flamands, 1932. Excerpts translated in English by G.de Croock out of the 1978 edition Pocket, Paris.